Cherry Mobile, in partnership with Air Asia, will bring your loved ones abroad back to the country in time for the upcoming holidays through the #CherryChristmas promo. The #CherryChristmas promo is Cherry Mobile's way of recognizing the sacrifices and hard work of Overseas Filipino Workers. This promotion is open to all Filipinos who have an active Facebook account and have a family that is working abroad. To join, participants must like the Cherry Mobile Facebook page at https://www.facebook.com/cherryphilippines/ and shoot a video that answers the questions "How does your OFW loved one make your life merry?" and "How do you want to thank him or her?" Then, upload it as well as complete the form found in the #CherryChristmas App located at https://www.facebook.com/cherryphilippines/?sk=app_208195102528120. The maximum video length is 60 seconds and must not exceed the file size of 25MB. There will be 10 winners who will be chosen based on a panel of judges and online votes. Each of the winners will receive the latest Cherry Mobile Flare S4 Plus worth Php7,999, Noche Buena package worth Php5,000 and 30,000 pesos in cash. In addition, the winner’s OFW recipient will be also receive round trip air tickets, which they use starting on December 5, 2015 up to January 31, 2016. Moreover, Cherry Mobile will shoulder all the taxes, travel fees and other expenses. 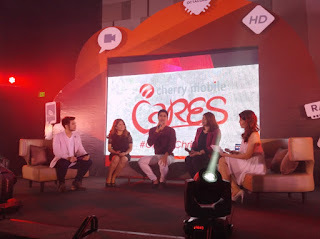 To know more about this great #CherryChristmas promotion, you can visit http://www.cherrymobile.com.ph/cherry-christmas-ofw-campaign.